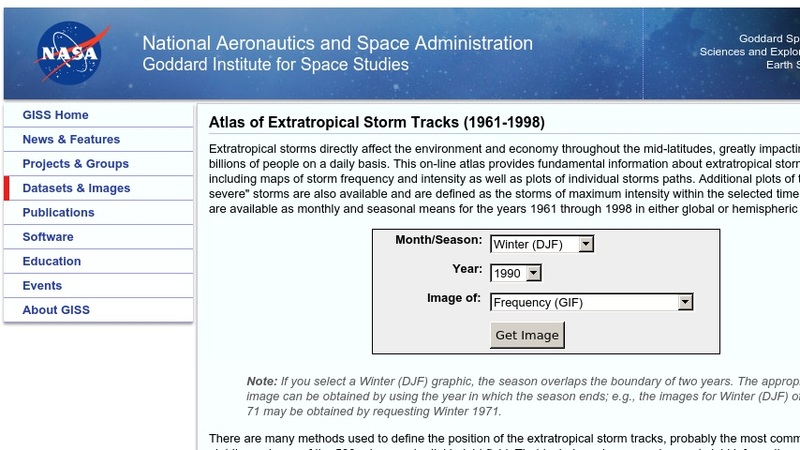 At this website, the NASA Goddard Institute for Space Studies offers an online atlas of fundamental information on extratropical storm systems in the mid-latitude during the last half of the twentieth century. Users can find maps of storm frequency and intensity and monthly and seasonal means as well as graphs of individual storm paths and the most severe storms. Researchers can download the storm track data and a FORTRAN program used to extract time and geographic subsets of the database. The website adequately describes how the computations and plots were created.